The Back Pasture | Faith. Family. Farm. Serving. Living. Loving. Laughing. Faith. Family. Farm. Serving. Living. Loving. Laughing. Jimbo, smiling crookedly, chin tilted in thought, his hands waving expressively through the early morning air, elaborated. We were climbing the blacktopped hill from Camp Andrew Jackson’s Old Hickory (a multi-purpose room) to the dining hall after attending an early morning church service. We were all from different places, all different ages, but we had come together once again for Workfest, the Christian Appalachian Project’s (CAP’s) alternative spring break program…a yearly event where volunteers gather together for a home repair blitz. Jimbo’s ponderings had been inspired by the words of the sermon we had just heard, given by Father Jim from Montclair State University. Father Jim, mindful of the place where he stood and the work we all were doing, had chosen to focus a portion of his sermon on Rev. Ralph W. Beiting – CAP’s founder. He pointed out how Father Beiting, when asked to lead a parish in eastern Kentucky, could have done just that and nothing more…and there wouldn’t have been anything wrong with that – dutifully carrying out the duties of a country pastor with a small but faith-filled congregation. But Father Beiting didn’t choose to just do his job – he chose to do more. He was a pastor, he built churches, he preached the gospel in the streets…but he also took a good look around his community. 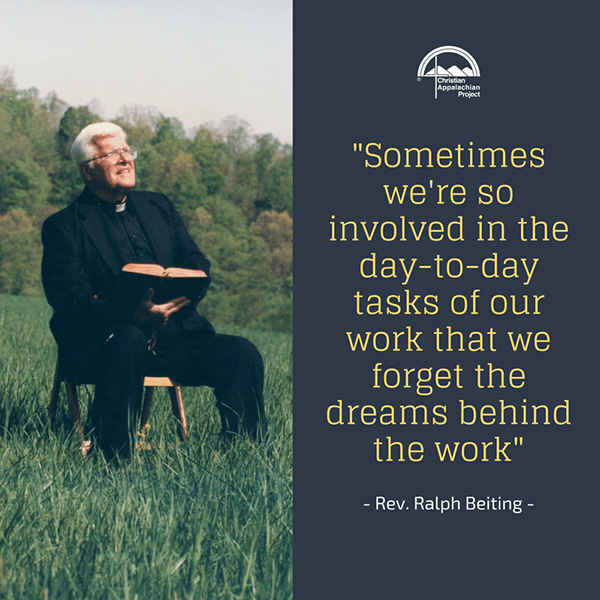 There in the beautiful hills of eastern Kentucky, he saw the wounds of poverty – homes badly in need of repair, limited job opportunities, adults and children in need of hope – and he felt God calling him to do something about it. So he started the Christian Appalachian Project. He started adult education programs. He created job opportunities by starting a factory and a dairy farm. He started thrift stores where people could buy clothes at affordable prices. He started preschools and summer camps. And he knew he couldn’t do all this alone. So he found volunteers to help him work. He looked through the phone book and called up people randomly to ask if they would be willing to make donations. When he felt that God was asking him to do something for the people of the mountains, he did it, even when it was hard and he faced opposition. Some people are born with the wonderful ability to bring people together and get things done…and he was one of them. Father Beiting died several years ago, but his work still lives on. The Christian Appalachian Project has become one of the largest non-profit organizations in the region. They repair homes, run thrift stores and food banks, preschools, summer camps, provide assistance to the elderly and more. They get a lot of help from volunteers who come from all over the country to work and pray together. I was one of those volunteers. I first came to CAP in 2011. I spent two and a half years of my life in the hills of southeastern Kentucky working with them…and have been back for at least a couple weeks every year since my first arrival. it was a scary thought. Never to have helped David and Matthew with their reading, smiling at their sweetness. Never to have played kickball dodgeball with the kids at the afterschool program (I’m pretty sure my glasses are still crooked from when Mike hit me in the face…). Never to have explored the beauty of McCreary County with Kate and anyone else who decided to join us for a hike. Never to have laughed with Nathaniel over making ridiculous summer camp awards. Never to have blinked back tears of joy seeing the happiness in a camper’s eyes. Never to have folded laundry with Carlo. Never to have gone canoeing with Priscilla, singing hymns in the dark. Never to have laughed at life with Clarence and Carrie in the office every morning. Never to have sat and talked with Mary in the camper she was so tickled to have as a new home. Never to have joked with Danny at the hardware store. Never to have climbed to the top of Pretty House with Shelby and Anna, laughing as we went. Never to have listened to God whisper in the wind at the top of the Pinnacles with Debbie. Never to have had Larry explain how to build a wall, handing me a chocolate candy from his pocket as he talked. Never to have sang around a campfire with a guitar-toting Janean. Never to have experienced a lovingly awkward, face-smashing Jay hug. Never to have come here for Workfest 2019. Never to have taught two wonderful girls how to put up siding one day, and then sat back and watch them killing it on their own the next. Never to have joked around with Heather while Fred the dog wandered around at our feet. Never to have seen the incredible gratitude of the Smith family whose house we were working on – making us angel-shaped sugar cookies “because we were angels”, helping us hammer in tricky upside-down nails, pulling their little girl with the golden curls in a wagon around the yard. and all because of one man who decided to do more than he had to. Matthew sat on the scratched and scarred wood of his bedroom floor, tape dispenser gripped between his dimpled fingers. There was no preschool today, so he had been left to his own devices. He was still in his pajamas, which were just a tad bit too small for him, and his brown curls were tousled and leaning against his forehead. His face was screwed up in concentration, tongue hugging the corner of his mouth, as he busied himself with the task of decorating his bedroom door with copious amounts of the clear scotch tape he had found on the coffee table downstairs. There was no one around to tell him to stop. David would have, if he were home, but he was sitting at his elementary school desk several miles away. Momma was asleep after a late night out with friends; and Matthew didn’t really know his father. For him, the word “Dad” was attached to packages that showed up in the mail on Christmas and birthdays – and little else. David remembered Matthew’s father, but Matthew didn’t. David was Matthew’s brother – Matthew’s half-brother really. He was small for his age and skinny, with mouse-colored hair and large blue eyes that, if he had been home, would have been quick to discover Matthew’s indiscretion and quick to correct it. He was only seven, but he noticed things. Momma, on the other hand, never noticed much. Wrapped in her own little world, she moved from house to house, from boyfriend to boyfriend, from job to job. She liked late nights and avoided early mornings. She loved to sing, clear-throated and carefree. When she was in a good mood, she would dance around the living room, grasping the boy’s hands and swinging them around the carpet. David loved Momma – but he also knew that something was wrong somewhere, and he was troubled. In the morning, Momma liked to sleep in, so it was David who would get himself and Matthew ready for school. He would pull a stool up to the kitchen counter to get the cereal from the high shelves. He would help Matthew get dressed and then hold his hand as they waited for the school bus. Momma would be there when they got home, full of smiles, but when evening came, she often slipped away to be with friends. So David would put Matthew to bed, first making sure that he scrubbed his face and hands with the blue washcloth that hung next to the sink and brushed his teeth with his red dinosaur toothbrush. They shared a bedroom, so when the lights had been turned out and they had both climbed into bed, David would tell Matthew bedtime stories. Some were stories that he had heard at school, and some were ones that he made up out of his own head. Rocket ships and dragons…dogs that could talk and cowboys who rode horses into the sunset. He told Matthew stories the same way that Matthew’s dad, Jason, used to tell him stories. David had loved Jason. Momma had met Jason at the repair shop where he had fixed her car. He had a contagious laugh and hands that knew how to work. He would get up early in the morning to help David onto the bus and would sit at his bedside and read books to him at night until he fell asleep. When Matthew came along, Jason had wanted to marry Momma – asked her more than once, but she always said no, much to Grandma’s exasperation. David had heard Momma and Grandma talking in the kitchen one day. David had gone to school the next day and asked his teacher to explain this mystery – this word “burden” – to him. The answer had dropped a seed of worry in his stomach that never went away. After a while, right around Matthew’s first birthday, Jason left, taking his laughter and his stories with him. David cried bitterly for days until one sunny Sunday when Momma plunked her coffee cup down on the table in exasperation. David had swallowed his tears and left the room. Momma poured the rest of her coffee down the sink and sighed, a twinge of guilt stirring in her stomach. She knew how much David had liked Jason…but, well, Jason had just expected too much of her, that was all. She wasn’t a “settle down” kind of girl. She didn’t want that kind of life. She loved David, in her way, but she didn’t understand him. He was much too serious for a child. So, from then on, whenever David missed Jason, he would swallow his tears until bedtime, when he would curl up on the floor of his closet to muffle the noise and sob brokenly. No, Jason wasn’t his Daddy (David wouldn’t know his own Daddy if he passed him on the street), but he had loved him just the same. It was a long time before a knock on the door or the ringing of the phone stopped bringing a leap of hope to David’s throat. Surely, Jason would come back…but, after a few initial visits to little Matthew, he never did. Jason had met someone new, someone who did not like constant reminders of another child from a woman who was not her. And Jason did not like being reminded of what a fool he had been…so the visits stopped. Jason knew he was wrong, but tried to sooth his guilt by sending child support and presents. Nevertheless, there were times when Jason would get up in the middle of the night and sit at his kitchen table with his head in his hands, hating himself, because he knew he was a coward. And David was left crying in the dark. But he was determined that his little brother Matthew should not know these tears – that Matthew should not feel the ache of something missing – of something terribly wrong – that he did. So he took care of Matthew the way that Jason had taken care of him, and tried to stop his anxieties from drifting into his laughter or the bedtime stories that he shared with Matthew at night. So Matthew grew, knowing little of David’s struggles. He was young…and merely knew that he loved David with his stories that created new worlds, and his Momma with the voice that filled his afternoons with song. And he loved discovering new things – like this tape dispenser. So, sleeping Momma below and David safe at school, he tore more and more tape from the dispenser and stuck it to the door. …Several miles away, in a new town, David and Matthew walked home from school. Older, taller, David was still thin and his blue eyes were still just as serious and piercing. He had changed though – the confusion behind his eyes and the worry in the pit of his stomach had grown into something new. He no longer wondered what was missing or what was wrong; he understood things better now. The confusion and the worry had been replaced with other things…things that did not belong in someone so young…anger…resentment…bitterness. There was a certain dip in the eyebrows and a crease across the forehead that ought not to have been there. I have a slight headache tonight. There is a song playing through my headphones on repeat…quiet words strummed across space. The music reminds me of something…something that has been on my mind a lot over the past couple of weeks…something that I can not write about yet. There is a stack of books at my feet. I am starting a study in fiction this month. Theme: Christmas. The pile is mostly kid’s books that I have had since grade school, anchored by the inevitable Dickens. I pull them out every year, completely disregarding reading level or quality, the same way I pull out my Chipmunk Christmas cassette tape and my Christmas television specials…Rudolph the Red-Nosed Reindeer, Frosty the Snowman, How the Grinch Stole Christmas. It’s tradition, and I like tradition. I hug tradition to my chest and let it dance me across the room. Sing those old songs to me. Raise my spirits and shake my November pains away. Heal wounds with love, soothe fear with faith, let sadness surrender to joy. Here I am with my music on repeat, my stack of books at my feet. We spread the newspaper on the table, letting the ads for new cars mix with the letters to the editor and the article about the new low-income apartment complex in town. A new tablecloth, thick with print that smudges our fingers. Then we carry in the pumpkins; orange, plump, expectant. They rest calmly on the newspaper, faces blank. With the aid of a trusty carving knife, the pumpkins take off their hats. We peer inside at the mixture of tangled orange tendrils and white tear-drop seeds. Then in we plunge, hands grasping slimy squishy slippery pumpkin guts. It’s hard to decide how to feel with the unusual sensation of pumpkin guts in the palm of our hands: grossed out or strangely satisfied? Once the hands have scooped out all they can, it’s time to call in the back-up: a trusty spoon. The spoons slide along the walls of the pumpkin, smoothing it into a more desirable texture. Now the pumpkin is ready to hold a candle. But it still needs a face. So we find a pen and scrunch up our own faces in thought. What kind of eyes and what kind of nose? The curve of a smile or the downward creep of a frown? The outline of a face appears in shaky pen marks across the uneven surfaces of the pumpkins. Then in plunges the carving knife. The pumpkins take on a personality. The plump round one cheerily grins despite missing teeth. The tall thin one shows its fangs in a stay-away-from-me pose. The biggest one stares oddly forward through square eyes. They are Jack ‘O Lanterns, fully prepared to greet the night. Come, Halloween! We’re ready for you. (He said it like someone who knew what he was talking about. Like someone who had captured all that is fall…the crispness of an autumn wind, colorful leaves curled and crunching under a pair of sneakers, the chill of football field bleachers beneath jean-clad legs, the soft creak of freshly picked apples squeezing together in the box as the picker leans over to empty her bag, the excitement of children choosing the perfect pumpkin, the taste of chocolate pulled from a Halloween treat bucket and peeled from a wrapper embossed with smiling bats, and the thrill of riding on the fender of a tractor while Dad picks a field of corn, brown and yielding sturdy dimpled yellow ears…ground it all into a seasoning and bottled it up. Put it in all the local grocery stores – took it to farmer’s markets. He would stand behind the table, smiling at the passersby. And they did taste it. They tasted it sprinkled on their Sunday dinners and almost felt the cool breeze of early October as they sat in the sweltering heat of late July. They tasted it mixed in with their early morning oatmeal in the cold bare grip of February, and remembered the beauty of the leaves before they fell off the trees. They tasted it, and they loved it. He sold it by the hundreds, by the thousands, then closed up shop. It was time to retire. So he took his secret recipe and tucked it away into a corner of his attic – only to be pulled out for family holidays and gatherings of special friends. The heat ushered itself in early this summer, floating in on puffs of dry air and climbing down on sun rays from the sky. It rested on tree tops and sank into the earth. It completely made itself at home. Except the rain never came. The summer is meant to be a delicate balance between the heat and the rain. The heat, the rain. Heat, then rain again. It is this way that the crops grow. The summer heat had arrived, but the summer rains…had not. So the crops waited. Two weeks…three weeks…four. The sun-baked earth dried up around their feet. The crops began to cry out for rain. The newly-planted cherry trees stretched their roots deeper into the soil, fingers trembling desperately to find water. If it would not fall from the sky, perhaps it would rise from the ground. But the ground had been baked in the heat for so long, it had given all that it could give. The corn plants were also reaching deeply with their roots – and also, finding nothing. The sun was almost beginning to feel painful. So the corn curled up inside itself – the stalks became thinner and the leaves more brittle. Then one night the air grew heavy. The sky had been a restless gray all day. The air was so thick it could be felt against the skin and the sky shook with thunder. The corn turned its drooping leaves upward towards lightning-shorn clouds and thrilled with expectation. Surely, surely, now the rain would come. …and it did, pattering quietly down onto the leaves, dripping down their sides like tears of joy. But then, suddenly, it stopped. It stopped before the rain ever had a chance to reach the roots. The plants sighed and bowed their heads, curling back up into themselves. The rain had played a cruel joke on them. Two more weeks passed by…July had melted stickily into August, the last real month of summer. The leaves of the little trees began to turn yellow, and some of them, the least fortunate, gave a final breath and turned brown. The corn plants in the field were stunted, limbs thin, stalks browning. Still the heat. Still the rain that never came. Until today. Today I take a walk out in the back hay field and slip into the woods. The grass is wet from the heavy rain of last night. Water drips from the trees and slides down bark darkened with rain. A sparrow rests thoughtfully on the stem of a Queen Anne’s lace, bowing slightly in the breeze. The corn and the little trees thrill to the damp and drink deeply. The rain clouds still hang in the sky, subdued but not asleep. A mist floats down from above, freckling my face and speckling my glasses…. and for this, like the fruit trees, like the corn, like the earth…. I turned my eyes from the window, where I had been watching the Appalachian hills of southern Kentucky slide by. Diane Smith was a woman who had worked in the same building as me when I volunteered with an after-school program in Kentucky. I had my doubts as to whether or not she would remember me, but I certainly remembered her. She was one of the first people I ever met in Kentucky. I was at the community center where she worked for my initial interview and to check out the place to see how I liked it. She was taking a smoke break in the summer sunshine outside of her office. A smile creased her face below iron gray hair as I walked by. Luckily that “maybe” did turn into a “yes”….and I found myself working there, just a walk through the gym and down the hall from Diane, surrounded by the trees of the Daniel Boone National Forest. While I neither worked directly with Diane, nor saw her on a regular basis, she soon created an unforgettable place in my memory. CAP once wrote an article about her that described her as a woman of faith, and when I read that for the first time, I said (out loud, to no one in particular): “That is soooo Diane.” And it is. Diane has a deeply-rooted faith that shines through her interactions with everyone. …but if Diane said there were ghosts in the school….well….I shrugged my shoulders. It might be true; Diane wouldn’t say something if she didn’t believe it. Yes, Diane was certainly memorable. And this is why, when Janean asked, six years down the road from the last time I had seen Diane, if I would like to accompany her on a visit, I said yes. I was back in Kentucky for a brief two-week volunteer stint and had spent the first week battling an ever-drifting soul fog. I was at the beginning of the only weekend that I would get to spend here, in my second home state. “Diane’s husband died a couple weeks ago, and she was just in the hospital, so I don’t know if this’ll be a good time for a visit or not, but we’ll try.” Janean turned up the gravel driveway. Ahead of us was a house fronted by a ramp that wound up to the front porch. That was another change that had come into Diane’s life since I had last seen her: she was now in a wheelchair. We walked in the door to the yaps of a very round and graying Chihuahua. Diane was there in her kitchen, her hair smoothed back with a head band. She smiled and laughed as Janean entered, opening her arms for a hug. “Do you remember Elizabeth?” Janean nodded her head towards me as we took a seat at the table. “Yeah, I volunteered with CAP here about six years ago.” I settled down into my chair. Diane nodded her head. The dog still stared at us with distrust and gave out an occasional yap. “Don’t mind Pinto Bean there. He’s just protective of me. It’s alright Pinto Bean, these are friends!” The dog turned and went back to his seat, walking stiffly on his rheumatic legs. “Yes, we’re growing old together, aren’t we, Pinto Bean? It’s just us two left here now. I was looking through some old pictures of Randy today. You want to see them? I’ll go get them.” She left the table and came back, a stack of pictures in her hand. We flipped through them as she told us stories about her husband. As we listened, our smiles grew as we became acquainted with a younger (and slightly wilder) Diane. “You know, I didn’t really like him when I first met him. I was playing drums, wearing my blonde wig. I used to wear that wig a lot – kind of to hide myself from the cops. I had a Mustang back then, and woah, was she fast. There wasn’t a car around that could beat it. The cops didn’t like it, but I had a lot of fun.” She paused, a smile parting her lips, her eyes looking back over the years. Janean and I split a can, pouring one half into an old diner coffee cup pulled out of Diane’s cupboard. “Oh, you know who I saw last week? Tom Vickers. He said he knew you way back when.” Janean took a sip from her cup. I smiled sadly. How strange it is…the things that we think take away from our value…as if being in a wheelchair could make her soul shine any less brighter than it did. We sat there for while longer, while she mixed stories of her younger years with bits of advice for us…from financials to what pills not to take if you didn’t want your hair to fall out. Soon enough though…that good-bye time came and we stood up to leave. We smiled, said our final good-byes and stepped out the door and back into the early spring air. The sky was blue, pillowed here and there with the touch of a cloud. The hills of Appalachia were curving up to meet it. And I was standing there, with gravel underneath my feet, and a soul fog lifting from my heart.